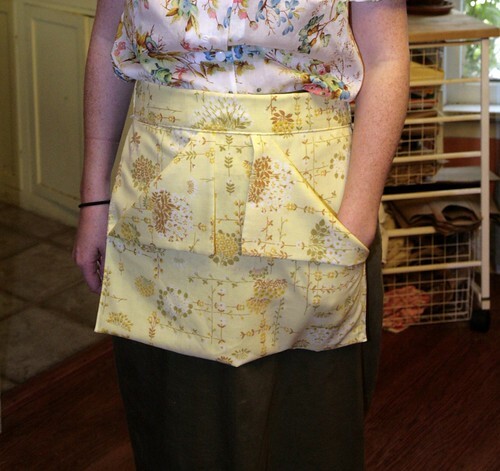 Inder Loves Folk Art: Pillowcase Clothespin Apron. I haven't sewn much this past week, but I did take a little time on Sunday to test a pattern for my new bloggy friend Jeannie at Life on the (Clothes) Line. After I posted about Nanny's recipes last week, I sent a quick email to Jeannie to let her know that I thought her series on her great-grandma's recipes was awesome. Since then, we've exchanged a bunch of emails, and we have tons in common: sewing, an appreciation for history and old-timey stuff, clotheslines, cute kids. It's hard to believe I've only known her for a week! 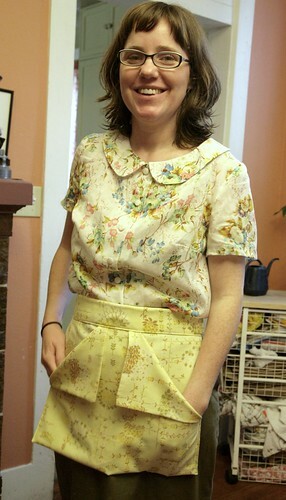 So I was very honored to test her pillowcase clothespin apron tutorial. It's super easy to put together, requires only one pillowcase and thread, and leaves almost no scraps. I used a yellow printed pillowcase that I suspect is a cotton/polyester blend. That's perfect, because I prefer to sleep on 100% cotton so I could repurpose this with no qualms (wash and wear!). Because I have a pathological inability to follow directions to the letter, I omitted some of the topstitching that Jeannie uses (also, my bobbin case was giving me some trouble, making topstitching a pain in my rear). It's a pretty subtle difference, though. Here I am modeling it with my Colette Violet Blouse. In other news, I might be getting a new sewing machine, thanks to my sweet and thoughtful husband!! And by new, I mean, new. I've never had an actually new sewing machine, I've only ever had new to me sewing machines, so this is a big deal. While vintage machines have served me really well over the years, I am not deaf to the siren call of a stretch stitch (other than zig-zag), invisible zipper foot, and decent buttonholer! (And I don't know - a bobbin casing without a spur that tangles up my thread and ruins my topstitching might be nice too.) Stay tuned! Eek, yes, the notion of a proper stretch stitch almost has me thinking of the benefits of a new machine. It's the aesthetics that put me off, isn't that shallow? Actually I've been dreaming about a coverstitch machine but that seems a bit too specialist. Cute apron. I found myself wearing an apron with a big pocket to hold seed packets while planting in the garden the other day. This would work a treat.